GDPR, which will take effect May 25, 2018, makes major changes to all of Europe’s privacy laws and enables regulators to fine noncompliant companies up to four percent of their global turnover or 20 million Euros, whichever is greater. SmartFlow Enterprise 2017 is a complete solution that includes business analytics, customizable reporting, an open application programing interface, (API) and integration with Salesforce.com. SmartFlow’s technology is protecting over $15 billion in licensed software applications worldwide and has been shipped in over 500 products. In addition to configurable data collection, SmartFlow Enterprise 2017 offers several innovative new features that provide a comprehensive approach for fighting software piracy and license compliance case management. SmartFlow is the only truly open license compliance solution on the market, enabling users to integrate with a wide variety of data sources, including SmartFlow, proprietary, and third-party sources, to drive their compliance program. Customers’ own software activation or registration data can be correlated with usage data from SmartFlow’s software development kit (SDK), or, for example, Microsoft’s Azure Application Insights. This unique open approach enables enterprises to maximize the impact of their data and reliably build cases against entities using customers’ software outside the provisions of the licensing terms. 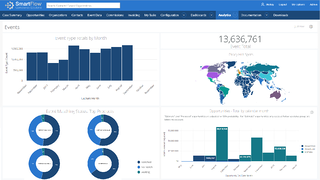 SmartFlow Analytics is a best-in-class business intelligence and custom reporting module that helps customers make sense of the patterns that emerge from the volumes of the data being collected by their SmartFlow compliance management software. Completely customizable dashboards provide insights so that more informed decisions can be made about addressing non-compliance issues. SmartFlow Enterprise 2017 supports custom regions, multiple roles/responsibilities, custom event types, and advanced data hashing and privacy controls. Enterprise also includes an open application programing interface (API) on the gateway, as well as complete integration with Salesforce.com. SmartFlow Enterprise 2017 is available immediately. SmartFlow technology is licensed on a subscription basis, starting at $25,000 USD per year. For detailed pricing or more information, contact info@smartflowcompliance.com. SmartFlow Compliance Solutions (SCS) was created to help software vendors combat piracy and under compliance with automated tools that minimize the resources needed to identify software abuse and tackle revenue recovery. Over a decade in development, the company’s innovative SmartFlow identification and analysis software represents the best practices of license compliance programs within the world’s leading companies, providing clients with insight on how incompliance and piracy are affecting their business, customers, and profits.